Hawaii Gov. 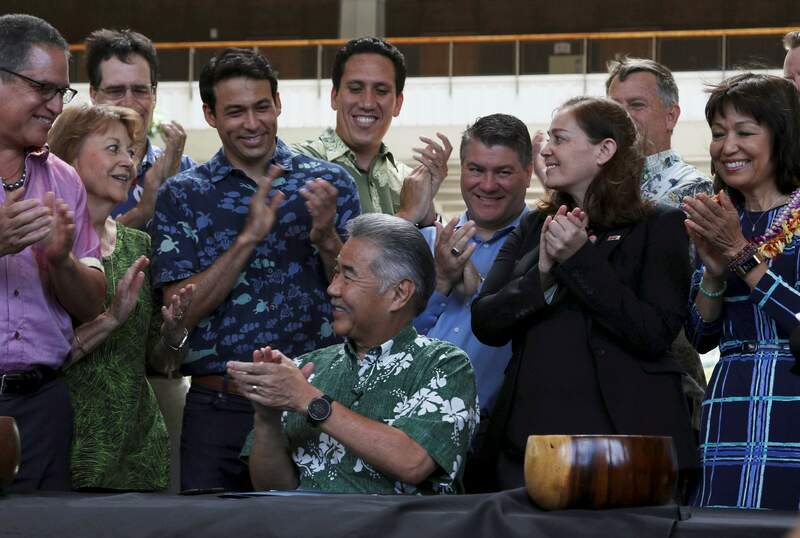 David Ige applauds after signing legislation in Honolulu on Tuesday, July 3, 2018, banning the sale of sunscreens containing two chemicals believed to harm coral reefs. The law makes Hawaii the first U.S. state to enact a ban on oxybenzone and octinoxate. The prohibition takes effect in 2021. HONOLULU (AP) – Hawaii Gov. David Ige on Tuesday signed legislation that will ban the sale of sunscreens containing two chemicals believed to harm coral reefs. Critics say there aren’t enough independent scientific studies supporting the assertion that the chemicals harm coral reefs. The group Retail Merchants of Hawaii has said it’s concerned the ban will discourage people from buying sunscreen at brick and mortar stores. “We know the tide is against us. We’ve got limited amount of time,” Lee said.